First of all, this is not a tart. 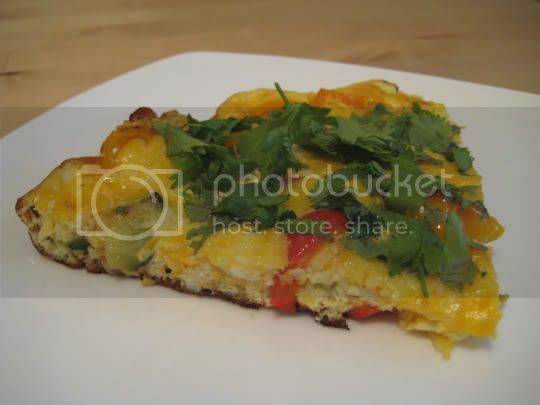 It's a frittata. I don't know why they couldn't just call it that. Anyway, my first experience making a frittata was an interesting one. Since I had to start this on the stovetop and then finish it in the oven, I had to use an ovenproof skillet...so I was happy to be able to use my new cast iron skillet for the first time. The "tart" got slightly burnt on the bottom, and I thought (maybe I was imagining it?) it had a slight metallic taste (yes, I cleaned out the cast iron before I used it). I'm sure it burnt because I failed to constantly lift underneath the eggs to allow the uncooked part to run under and cook, and as a result, I let it cook a couple minutes more than the suggested time to make sure the eggs were completely set. I also allowed a couple more minutes in the oven than was called for. Now, onto the actual dish. It was pretty decent. I've never made a frittata before, probably because I'm not big on egg dishes (they do not make good leftovers either). What saved this dish was the two cheeses (cheddar and Parmesan), and the sprinkling of cilantro on top. The veggies, peppers and zucchini, went almost unnoticed. Also, I think the cilantro should have been incorporated with the egg mixture, rather than sprinkled on top at the end. This would have been nice served with salsa, or maybe some more melted cheese on top. And even though the bottom was slightly burnt, I think it did add to the flavor. Make again? Ehhhhh, maybe. I would turn it into a scramble, rather than a frittata.